It is love that makes things happen. Okay, okay…that’s a bit cheesy. But it’s true! Because brewing beer without love just ain’t right…at least not if one wants to brew a good beer. It was a common love of Hallertauer Callista Hops, along with the mutual respect and adoration of three friends – namely “Rockstar Brewmaster” Stephan Michel, “Hops King” Mario Scholz (IGN Hopfen) and owner-operator of the beer label Tiny Batch, drummer Ansgar Freyberg a.k.a. “Sir Frank Doe” of The BossHoss – that inspired a unique beer called, “Mista Callista Spezial”. 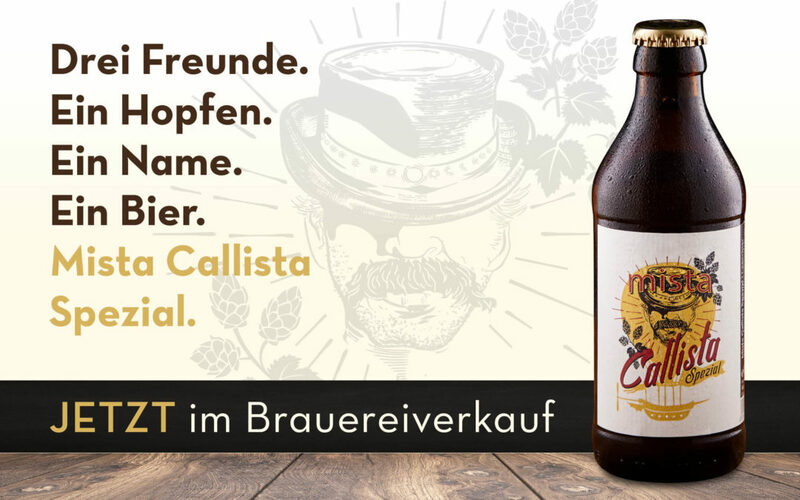 Introduced by hops dealer Mario Scholz from the Hallertau, Callista is a relatively new hops variation that has only been available on the German market for the last three years. A fantastic hop variety, encompassing complex aromas of sweet fruit and red berries, bringing a discrete sweetness that make this highly fermented beer (approx. 5.5% ABV) go down extremely smooth. This beer offers an impressive selection of ingredients. Brewmaster, and “The Pope of Yeast”, Frank Müller, from Brewery Riegele in Augsburg, personally provided another indispensable component: incredible yeast. “Mista Callista Spezial” is truly distinct. By combining the finest high-quality ingredients it culminates in a diverse taste explosion, crafting a beer that goes down surprisingly smooth, compels maximum drinkability and easily encourages another round. Now available in Bamberg’s Wunderburg!